The MLA poster at the link below is a printable jpg file you may download and print out at different sizes for use in classrooms, writing centers, or as a pocket reference. Please keep in mind that the file size is large (print-quality, 120 dpi), so it may take a while to download. You may adjust the print size of the poster from your print menu. As is, the poster is 27 x 36 inches. Because the poster is quite large, standard printers cannot print the poster. If you do not have access to a printer that can print large documents, contact a local print shop. The Purdue OWL cannot grant requests to print and mail posters. If you do not have access to a print shop to print the poster, please use the resources we have available here for printing on standard 8.5 x 11 inch paper. Go to resource you would like to print, scroll down to the bottom of the page, and click "Full Resource for Printing." Also, please note that the poster only contains basic MLA guidelines. For detailed instructions, please see the complete OWL MLA resources here. 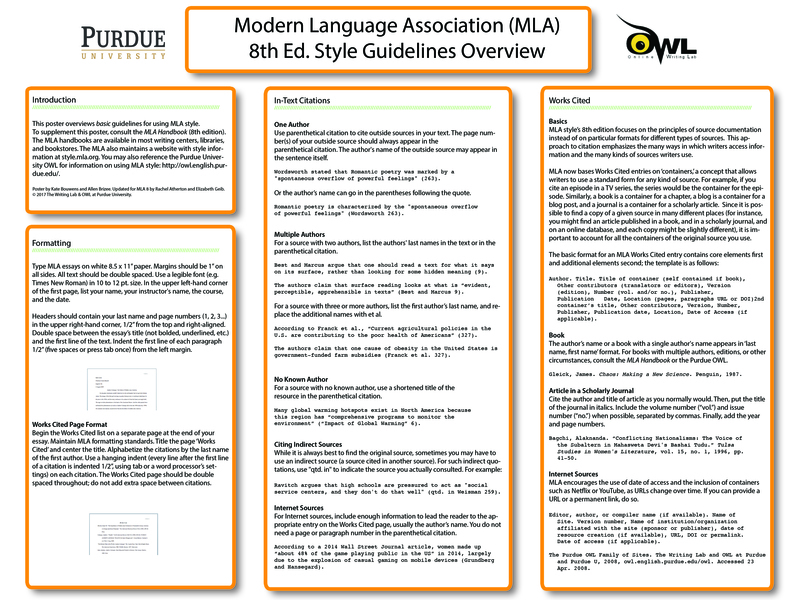 The Purdue OWL MLA Classroom Poster was developed by Kate Bouwens for the Purdue Professional Writing - Purdue OWL Internship class, English 490, in spring 2009. Successive contributors include Elizabeth Geib and Rachel Atherton.